Toys are meant to be handled and played with. It should not be a surprise that more than a few boys (and their fathers) also attempted to open their Big Trak to perform repairs. Most of the Big Trak parts are custom molded. So, your best best is to purchase a broken Big Trak from eBay and salvage the parts into a single working vehicle. However, there are a few off-the-shelf pieces that have brand new replacements. The photon cannon miniature incandescent light bulb (lamp) is a 2.25 V, 0.25 A, #222 GTL-3 screw base. It can be replaced with part number 1505K41 at McMaster-Carr or 606-CM222 at Mouser Electronics or 209533 at Jameco Electronics. These bulbs measure around 1.2 ohms in resistance. Given that the Big Trak drives the bulb from 3 V (or up to 3.2 V with fresh batteries) and doesn’t have a current-limiting resistor, at first I wondered how the current limit of 0.25 A was observed. It would seem that 3.2 V / 1.2 ohms = 2.66 A would be delivered. The 75494 is unable to deliver that much current and the internal resistance of the alkaline 'D' cells would also be a limiting factor. However, the fascinating truth is that the bulb filament increases in resistance (to around 9 ohms) when lit! The Big Trak screws are zinc-plated steel, #4 (4-24) threaded, 3/8 inch length, type 25 (ASA-BT) point, pan head, Phillips, thread-cutting screws. I would prefer stainless steel, but I have not yet located a retail supplier of that exact type of screw in either type of metal. The screws make their own threads by cutting into the plastic when driven. This saves the cost of threading the screw holes by hand. Left: Original zinc-plated Big Trak screw. Right: Acceptable stainless-steel replacement lacks cutting tip. The closest match that I’ve found for this screw is 92470A108 at McMaster-Carr. 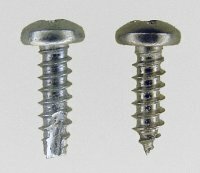 The McMaster-Carr screws are stainless steel (which is superior to zinc-plated) but lack the thread cutting point. This shouldn’t be an issue since the threads have already been cut into the plastic by the original screw. Left: Screw hole with threads. Right: Screw hole without threads. Higher-serial-number Big Traks are missing some screws! Some Big Traks only have 4 screws holding the main body to the base, instead of 6 screws. The middle 2 screws are missing. 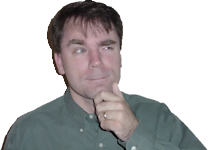 Some Big Traks have only 2 screws holding down the circuit board, instead of 4 screws. The 2 screws on the opposite corners are missing. You can tell if your Big Trak originally had all of the screws by looking in the screw holes. If any screw holes are missing threads, then they never had screws installed in the first place. The full compliment of screws really isn’t necessary. I suspect this was a money saving move by the manufacturer, not only saving the cost of the screws, but more significantly saving the labor cost and time. Another item missing from higher-serial-number Big Traks is the cardboard insert underneath the keyboard. You cheap so-and-so! Each of the middle wheels (the other wheels are not connected to motors) has a #232, 1/8 inch width, 2 3/4 inch inner diameter, rubber o-ring for traction. The rubber tends to crack over time. I replaced mine with Buna-N (the least expensive material), part number 9452K161 at McMaster-Carr. Left: Rubber o-rings on the Big Trak provide traction. Right: The o-rings crack with age. When you receive the replacement o-rings, don’t worry if the diameter seems a little too small to put on at first. They stretch. Lastly, if you lose the hex nut for the accessory plug, it is a 1/4-32 NEF (National Extra Fine). 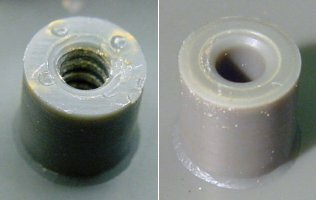 Part 91862A516 at McMaster-Carr is an adequate replacement, although the original nut has slightly larger outside diameter.